Workbenches: From Design & Theory to Construction & Use was compiled as a follow-up to Schwarz’s Workbenches: From Design & Theory to Construction & Use. It includes complete plans, expert instruction and rationale for building various workbench forms, as well as instruction on improving existing workbenches for better workholding, and an improved woodworking shop. Schwarz takes you through the design of 9 specific workbenches and critiques of 10 additional workbenches, as well as his suggestions for making any bench work most effectively for the type of work the user does. The 9 workbench plans have a range suitable for handwork and power tools. A discussion of workbench design rules teaches what is effective in a multitude of work situations, and why. 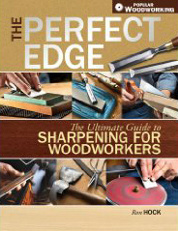 Along with expert instruction and rationale for building various workbench forms, improving existing workbenches for better workholding, and an improved woodworking shop, Workbenchesincludes guidance on additional workholding options–from shop-made jigs and commercial bench dogs to vise hardware.